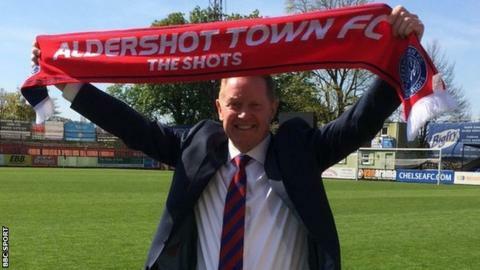 Aldershot chairman Shahid Azeem says the decision to hand players full-year contracts is a "calculated risk" for the National League play-off hopefuls. Aldershot have previously only been able to offer players deals from the start of July to the end of April. The Shots, who were in administration for parts of 2013 and 2014, are fifth in the table with five games to play. "What we're selling is emotion, the club getting the good feel-factor back" chairman Shahid Azeem told BBC Surrey. "It's a calculated risk, but you've got to have some kind of optimism because if you're too careful you lose all these players and then you end up trying to rebuild the team. "I think we've got a good group of people on the board, we've got investments coming in and if we're successful more people will get in." Aldershot's 2-0 win at Solihull Moors on Saturday was their fourth victory in a row and kept them two points clear of Dover, who have a game in hand, in the final play-off place.